I’m a nutrition coach, personal trainer and reformed ‘fat-boy’ with over 10 years experience in the industry. My passion lies with food – whether that’s talking about it, planning it or consuming it! The only thing I enjoy more than nutrition is working with people. Luckily for me I’m able to do both. A successful nutrition intervention or workout routine MUST take into account the needs of the individual. My skill is listening to and understanding my clients so I can create a plan of action. My aim is to achieve the desired results while making the entire process as doable as possible. This means incorporating the foods and exercises YOU enjoy first and foremost. I work in person, on the phone, and online to provide the support, guidance and accountability to help clients achieve their goals. I specialise in fat loss NOT weight loss. This essentially means losing fat while retaining muscle to create a lean athletic physique. Whether that’s guys that want to get ripped or girls that want to be toned – I can help. 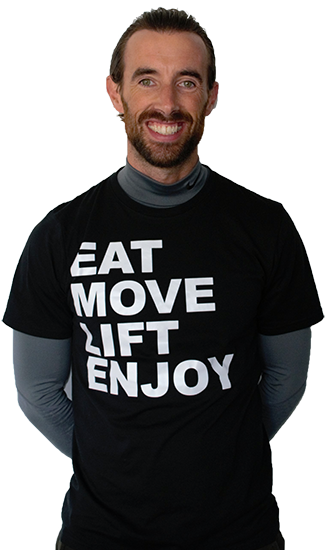 • Since joining the team at Koru I’ve enjoyed working with strength athletes. Putting together nutrition protocols that support intense training schedules and maximise muscle gain is incredibly satisfying – especially when the lift numbers start increasing! If you’re reading this and think you could benefit from my nutrition expertise I’d love to help.